Today on International’s Women’s Day, we here at The Cotton Gin not only celebrate the amazing brides that have chosen our venue to celebrate their special day, but we celebrate the amazing women that they are in their every day lives. Many of you are not only wives, but you are mothers, daughters, students, full-time workers and so much more. Women, it is important to remember that not only today, but everyday, you are beautiful, strong, intelligent and courageous. Thank you to those women who are rocks for many different people in their lives. Thank you to the women who have struggled with their own battles but have carried others’ before their own. Thank you to the women who have had the courage to keep fighting even when it seemed impossible to finish the race. Thank you to the women who love so beautifully. Thank you to the women who give their time and efforts to many different things in life and still hold their family together. Thank you to the women who show their feelings and emotions and use them to make the world a better place. Thank you to the women who build other women up and not tear other women down. Thank you for the women who stand up for themselves. Thank you to the women who are bold. Thank you to the women who are confident in themselves and have raised/are raising their daughter’s to be the same. Lastly, thank you to the women who have embraced their womanhood. We are thankful to have worked with so many beautiful and inspiring women, and we can’t wait for all the women we get to work with in the future. Party favors may be a last minute wedding detail, but it is a detail your guest will take home and cherish! Party favors are an amazing way to connect with your guest and show them appreciation for attending the most special day of you and your SO’s lives! While party favors are important, you don’t want to spend tons of money on them. Here are 5 unique and affordable party favors that your guest will never forget! This unique party favor is a cute yet simple touch to your wedding night. While being inexpensive, guest can appreciate your creativity. Who doesn’t love some delicious honey? This favor allows guest to have a constant reminder of your unforgettable night. Day by day, you and your partner’s love for one another will grow. Give a favor to your guest that does the same! This appetizing favor will leave guest satisfied as they get to take this yummy treat home. Just like your wedding, guest will continue to have “s’more” fun as they prepare this snack. What a special gift to send your guest home with! Simply buy the mini bottles, make your own label and walah! Your guest will rave about these favors when they know have wine to drink in the fridge, thanks to you! No better way to “spread the love” by giving your guest something they can use on their food! This favor can be inexpensive. Make the jam, make a label designated to you and your hubs and your guest smile from ear to ear! These 5 favors will surely make a mark on your wedding day! Be creative, think outside the box! Give your guest the most unforgettable gift from the most unforgettable night. The Cotton Gin at Mill Creek was announced a winner of the renowned WeddingWire Couples’ Choice Awards® in Hiram. This is an honor the CG has received for the THIRD year in a row! We are so blessed to have amazing clients and we have gave them the day they have always dreamed of! Thank you so much for your wonderful reviews! The Cotton Gin at Mill Creek received this esteemed award based on their outstanding experience working with real newlyweds. WeddingWire features more than three million reviews, and these notable vendors all received prompt, reliable, and quality feedback. "We are celebrating our 11th annual Couples’ Choice Awards, where we honor our vendors who help make millions of couples’ big day one to remember," said Timothy Chi, CEO, WeddingWire. "Not only are these hardworking and distinguished wedding professionals, such as The Cotton Gin at Mill Creek, a fundamental part of the wedding planning process for engaged couples, but they help make WeddingWire a trusted source for wedding planning. We congratulate everyone on this well-deserved achievement." The Cotton Gin at Mill Creek is honored to be one of the top wedding businesses in Hiram on WeddingWire.com. For more information about The Cotton Gin at Mill Creek, please visit us on WeddingWire. To learn more about the WeddingWire Couples' Choice Awards®, please visit www.weddingwire.com/couples-choice-awards. Wedding day should be the best day of your life. As a bride, you should not have to be stressed or worried on your special day. At The Gin, we ensure that your day goes as smoothly as possible with the help of our amazing team. Although we take care of all your needs on that day, here are some personal pro tips to help guide you the morning of your wedding! Brides have the tendency to forget about this simple fact on wedding day. Take a breath and stop to make sure you are fueling yourself for the day ahead! No one wants the dramatics of a bride passing out at her own wedding! Eat some fruit, a bagel, toast, anything! Don’t worry about bloating. You are BEAUTIFUL. Remember that. Make sure to take care of YOU. 2. Turn some music on! While this is a serious day, it should also be the most fun day! Get up and dance around with your bridesmaids! It’ll get help get you even more pumped up and ready for your big day. There are plenty of wedding morning playlist on Spotify! Check one out and let lose! 3. Pack an emergency bag the night before! Here are some items that you might not want to forget on your day! Make sure you dedicate plenty of time for the pictures you desire! While your photographer will get candid pictures during your getting ready process, set aside an hour for the posed pictures of you and also with your girls. Also, try to take the majority of your pictures before the ceremony. Your guest want to celebrate you so don’t keep them waiting too long! Make sure you are there to thank them. Although you will be around many people on that day, make sure you spend some alone time before your ceremony begins. While this day is exhausting and draining, make sure you take a deep breath. Pray, meditate and focus on all the reason why you love your spouse. Today is ultimately about you and him. Remember that above all the chaos and noise. Today is the day to celebrate YOUR love for each other. Here at The Cotton Gin, we see examples of love every day. Putting together your dream wedding is our main objective. Although the actual wedding day is very important to us, we also want to see your marriage blossom and thrive each and every day. Maintaining the love and spark you have for each other on your wedding day can sometimes be difficult when life is thrown your way. For this blog post, we have some advice to help you start 2019 with your significant other the best way possible! Here are 5 ways to stay madly in love with your spouse. Be loving, show your affection! Start each day with a hug and kiss! There is no better way to start off your mornings and ending your nights with showing how much you love each other. Negativity is like a disease. It spreads. When your negative, your partner will more than likely reciprocate that. It is important to lift each other up, even in difficult times. Your spouse needs to always know that they have you in their corner! Although both of you may have crazy work schedules and busy lives, it is essential that you make time for each other. Even if it is just dinner once a week whether it is at a nice restaurant or a home-cooked meal, make sure you get in that time together. Spending time together allows continuous growth in your relationship which keeps that spark alive! Neither you or your spouse is perfect and it is important to remember that. We all make mistakes. Be patient with each other as well as show kindness when you feel like getting frustrated. Instead of getting into an unnecessary fight, practice open communication that is calm and understanding. Remember to show your gratitude to your spouse. Remember, they do have to put up with you! But in all seriousness, in a successful marriage, you are constantly sacrificing for one another. Make sure your spouse knows how thankful you are for him/her. Ways you can show your thankfulness is not only gifts but words of affirmation, quality time, acts of service, and more! The Cotton Gin hopes you have an amazing start to your 2019 and a successful and happy marriage along the way! Here at The Cotton Gin, making couples happy on their special day is our main objective. As we exit our busy season, we understand above all the time, attention to detail and the mix of emotions that go into our wedding weekends, we reflect on the sole reason we do what we do: love. We believe in the power that love holds. Throughout this year, we have seen so many examples of the beauty love between couples, family and friends entails. We are fortunate enough for all of you to let us experience the most important day of love in your lives. As we are entering into the hectic Christmas season, it is easy to get caught up in the chaos the holiday can bring. We often let our worry triumph the love and moments that come with the season. We worry if our gift is good enough for so and so. Will we be able to make it to the Christmas party we got invited to? Will Grandma show out again at the dinner table? We CANNOT forget what truly brings us together. Just as 1 Corinthians states, love is patient. Christmas time has the ability to test our patience to the limit. We must rejoice in the truth of realizing how blessed we are this season. Although circumstances and situations may not be ideal, take a moment and look around you. Love is everywhere. It’s official! You love us and we could not be more thankful! 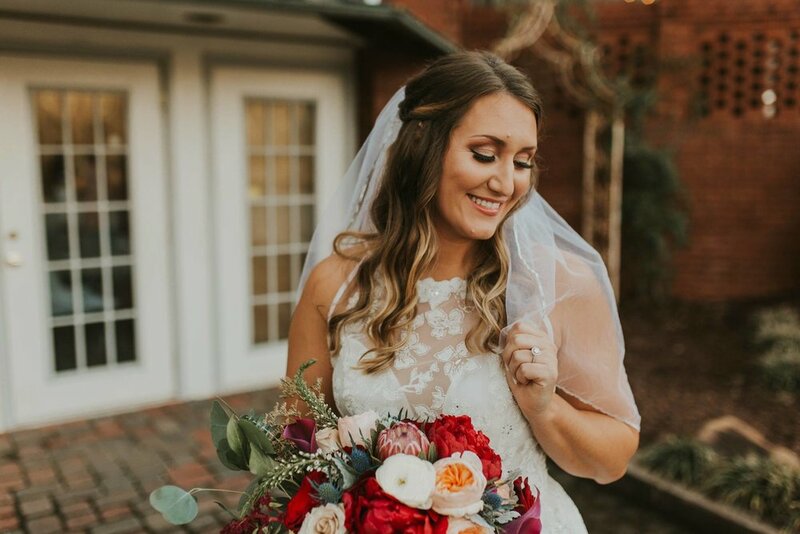 We are pleased to announce that The Cotton Gin At Mill Creek has been selected as a 2019 winner for the Knot Best of Weddings, an award representing the highest-rated wedding professionals as reviewed by couples, their families and wedding guests on The Knot, the leading online wedding brand and app. This is the third year in a row that The Cotton Gin has received this award. According to The Knot, winners represent the best of the best wedding professionals that a bride or groom would want to consider booking for their own unique wedding. To determine the winners, the online wedding brand assess over three million reviews across the various vendor categories—venues, musicians, florists, photographers, caterers and more. Again, thank YOU for making this possible once again! We love and appreciate all of amazing clients and are looking forward to the future! After some time not posting, we at the Cotton Gin are proud to announce we are back with our blog posts! Our blog posts will feature wedding/marriage advice, tips for your wedding day, DIY projects, recipes, introductions to our staff and much more. We can’t wait to pour into your lives and allow us to bring just a touch of happiness to your lives through our words. Please share your thoughts and ideas with us!